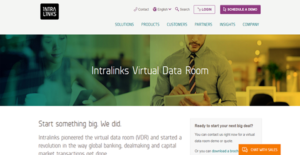 What is Intralinks Virtual Data Room? Intralinks Virtual Data Room is a pioneering innovation that integrates artificial intelligence to facilitate high-value transactions. It has a clean an intuitive interface that paves the way for an enhanced user experience. On top of that, the solution is versatile and adaptive to mobile devices’ screens. Intralinks Virtual Data Room also works fast to help you successfully close transactions at a quicker pace. Standard application processes are completed swiftly and multi-stage workflows are finished rapidly. With Intralinks Virtual Data Room, you can ensure that your business data is stringently guarded. You even have the means to modify access rights instantly in the software without having to use plugins. The integration of artificial intelligence into Intralinks Virtual Data Room transforms the standard procedures of the application. The technology fully automates document sorting and contract reviewing for you to reduce your time spent on administrative tasks. More than that, the solution’s machine learning tools help you avoid costly errors. The main reason why 99% of the Fortune 1000 trust Intralinks Virtual Data Room is its security. The application gives them the confidence that their highly sensitive business information is safe from unauthorized intrusions. You can also enjoy the same sense of security when you sign up with the software. Deals require powerful information organization and retrieval functions. Intralinks Virtual Data Room offers those two things and more. With its intuitive user interface, you can expeditiously complete tasks and focus on deals rather than spend more of your time familiarizing yourself with tools and features. Intralinks Virtual Data Room promotes seamless collaboration between enterprise partners. Because of its security measures, the software provides dealmakers with a fortified platform to share confidential documents with each other, thus accelerating the closing of transactions. If you are considering Intralinks Virtual Data Room it may also be sensible to investigate other subcategories of Best Virtual Data Room Software listed in our database of SaaS software reviews. Companies have different wants and requirements and no software application can be ideal in such a situation. It is futile to try to find a perfect off-the-shelf software app that fulfills all your business needs. The smart thing to do would be to modify the system for your specific needs, employee skill levels, budget, and other elements. For these reasons, do not hasten and subscribe to well-publicized popular systems. Though these may be widely used, they may not be the ideal fit for your unique wants. Do your research, look into each short-listed system in detail, read a few Intralinks Virtual Data Room reviews, call the maker for explanations, and finally settle for the app that offers what you require. How Much Does Intralinks Virtual Data Room Cost? We realize that when you make a decision to buy Virtual Data Room Software it’s important not only to see how experts evaluate it in their reviews, but also to find out if the real people and companies that buy it are actually satisfied with the product. That’s why we’ve created our behavior-based Customer Satisfaction Algorithm™ that gathers customer reviews, comments and Intralinks Virtual Data Room reviews across a wide range of social media sites. The data is then presented in an easy to digest form showing how many people had positive and negative experience with Intralinks Virtual Data Room. With that information at hand you should be equipped to make an informed buying decision that you won’t regret. What are Intralinks Virtual Data Room pricing details? What integrations are available for Intralinks Virtual Data Room? If you need more information about Intralinks Virtual Data Room or you simply have a question let us know what you need and we’ll forward your request directly to the vendor.